Show Them the Numbers, Scroll Helpful Messages! The LTT800 will track and display coin value deposited and time remaining when attached to most 24VAC external timers. It mounts directly on the door of a meter box and scrolls a changeable welcome introductory message up to 72 characters in length. The letters are 0.75″ high, and the polycarbonate enclosure is 3.8″ x 3.4″ x 3.1″. The Big Time BT900 will track and display coin value deposited and time remaining when attached to most 24VAV external timers. It also scrolls a changeable welcome introductory message up to 72 characters in length, and accommodates the X-Tra Time function. The letters are 2″ high by 8″ long in a sealed polycarbonate enclosure 10″ x 7.1″ x 3″. Also available in a low profile stainless steel enclosure (BT900-E) 12″ x 7.35″ x 2.5″. The Big Time BT900-2 has all of the same features of the above BT900 plus the ability to properly function with external timers having the Two-Timer function, such as the IDX AT422 vacuum timer or the GT200 and BT912 display timers as a second slave display. The Big Time BTC900 has a count up feature used with some credit card systems to inform customers of time being used. The new Giga Timer GT200 is a compact multi-feature display timer, which has many standard features including multi-value timing with count-down or count-up, the IDX Card Display Protocol™ and IDX patented Two Time Select™ feature. This new model exhibits a 20% reduction in power consumption compared to the discontinued LTT802 series and carries a 2 year warranty on the LED’s. The GT200 series will be found throughout the modern car wash in everything from the bay meters, vacuums & combo vacuum machines to camp ground RV dump stations. Three field programmable messages have been expanded to 127 characters each. Standard operating voltage is 24VAC with a 3 Amp relay output. Optional voltages 12VDC / 12VAC / 24VDC / 34VDC are available upon request. Size: 3.35″W x 3.80″H x 3.15″D. IDX introduces the next generation of display timers for meters, vacuums and combos. GigaTime model GT1200 features are multi-time, multi-function, Ultra Sun Bright LED display timer with double – wide scrolling letters. The GT1200 has incorporated all the same great-patented features of our other display timers rolled into one nice neat new size. It also includes the newest way to increase profits for operators, our patent pending LuckyTime™ timer feature. With LuckyTime your customers will win additional wash time & they will promote your wash for you. No other timers can offer this customer-pleasing feature. 3 Programmable messages – “Welcome”– “Sales”- “Thank You” plus 12 programmable 30 character Services Messages (one for each type of services offered) with one of 2 IDX remote programmers (RC800 corded or IR800 infrared). Size: 5.875″W x 3.125″H x 1.78″D. The Big Two Timer model BT912 displays coin value deposited and time remaining. It scrolls a changeable “Welcome” introductory message up to 72 characters in length with letters 2″ high by 8″ long. It includes the Two-Timer function, programmable BonusTime and X-Tra Time, and a plug for the RC800 or IRM800 remote control programmers. The BT912 comes in a sealed polycarbonate enclosure 10″ x 7″ x 3″ and has a solid state 4Amp 24VAC output with a short circuit proof option. The BT912-E comes in the 12″ x 7.4″ x 2.5″ sealed low profile stainless steel enclosure shown, includes an internally mounted last minute alert horn and has a 5Amp relay output. The Jumbo Two Timer model BT922 displays coin value deposited and time remaining. It has ULTRA-BRIGHT letters are 2″ high and 16″ long, and can be ordered in red, yellow or green. It scrolls a changeable welcome introductory message up to 72 characters in length and can optionally scroll the service name during timer countdown. It includes the Two-Timer function, programmable BonusTime and X-Tra Time, and a plug for the RC800 or IRM800 remote control programmers. It comes in the 22″ x 7.4″ x 2.5″ sealed low profile stainless steel enclosure shown, includes an internally mounted last minute alert horn and has a 5Amp relay output. 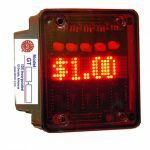 The Big Time DD810 is a digital display for Automatic Blowers with High Output LED’s. Like other Big Times, it has a “Welcome” intro message of 72 characters. It also has a 36 character “Interrupt” message (exp: “MOVE UP SLOWLY”) and a “Half-Way” dedicated message (exp: “YOU SHOULD BE HALF WAY THROUGH”). 72 character intro message, numerical time countdown, time interrupt message of 36 characters (such as “MOVE UP SLOWLY”) and half way message (such as “YOU SHOULD BE HALF WAY THROUGH”). 2″ high display, 24VAC power. The DD910 comes in the 12″ x 7.4″ x 2.5″ sealed low profile stainless steel enclosure shown. DD910 includes remote reset, acceptor disable, 5A relay output. The BT912-V Multi-Vendor Display controls up to 9 different vending machine product shelf categories. Works with input from product selector switch, displays product name (programmable – 30 different characters for each product) and price. If product selection is empty the coin acceptor is disabled and the display indicates “‘Product Name’ is Empty, Make Another Selection”. BT912-V has coin-in beeper internal to enclosure, timed 5A relay controls dispensing actuator, and it comes in the 12″W x 7.35″H x 2.5″D sealed low profile stainless steel enclosure. The LTT802-V Multi-Vendor Display controls up to 7 different vending machine product shelf categories. Works with input from product selector switch, displays product name (programmable – 30 different characters for each product) and price. If product selection is empty the coin acceptor is disabled and the display indicates “‘Product Name’ is Empty, Make Another Selection”. The LTT802-V polycarbonate enclosure is 3.8″ x 3.4″ x 3.1″ for internal meter box mount, and the 4Amp solid state output controls dispensing actuator. The BS820 Jumbo Message Center has 2” high x 16” wide display with eye-popping ULTRA-BRIGHT LEDS that are markedly visible in direct sunlight. The enclosure is 22.25” wide x 7.375” high x 2.50” deep. You can program 9 different 30-character “Service Messages” for display, each being controlled by a separate 24VAC Service Sense input signal. The unit continuously scrolls a programmable “Welcome Message” until a 24VAC signal is present on the external Timer Sense terminal (P1-6). Then it scans all 9 24VAC Service Sense terminals (P3-1 to P3-9) and sequentially and repetitively displays the “Service Messages” for each of them that are active. The BS820 Jumbo Message Center is perfect for use in conjunction with most auto tellers in an automatic carwash to convey pricing or specials information to customers. It can be used as a “Welcome and Information Sign” to promote the services offered to customers waiting in line, or it can be used as an “Instruction Sign” and/or “Exit Sign” within a rollover carwash. The BS820 has many other uses such as “Entrance Signage” for an indoor carwash or just for a message center promoting the wash. The BS820-A model provides the option to discontinue scrolling the message as soon as power is removed.